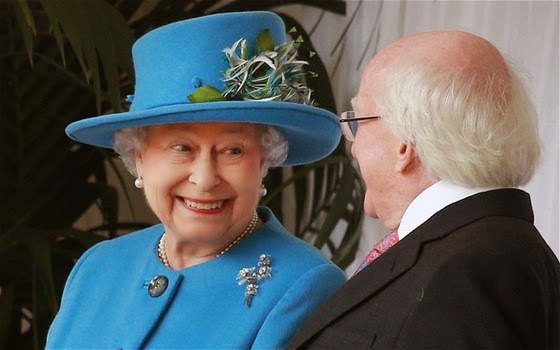 Irish President Michael D Higgins has met the Queen on the first ever state visit to Britain by the country's head of state. Mr Higgins and his wife Sabina met the monarch at Windsor Castle - three years after the Queen's historic visit to Dublin heralded the start of a new chapter in the relationship between the two countries. The significance has been further deepened with the presence of Northern Ireland Deputy First Minister and former IRA commander Martin McGuinness, who will attend a banquet hosted by the Queen - a move unthinkable only a decade ago. The streets of Windsor were decked out in Union flags and Irish Tricolours this morning ahead of the visit.